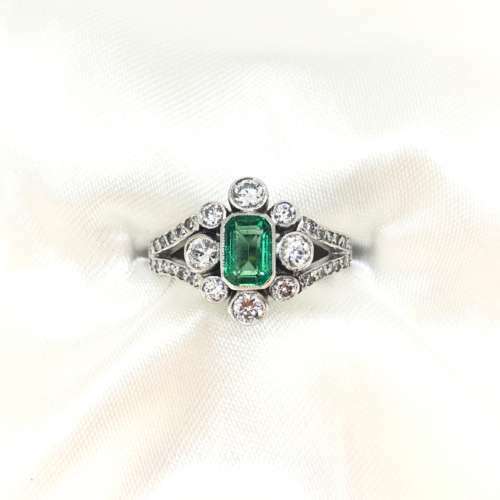 A double halo emerald & diamond ring, with a 0.65ct emerald cut emerald and an impressive fourteen round brilliant cut diamonds set in the inner halo and a further twenty two round brilliant cut diamonds set in the outer halo. There are a further four round brilliant cut diamonds on each shoulder. The total diamond content is 0.55ct. Set in platinum. Setting dimensions approx. 13.2mm x 11.8mm. Pre-owned.